So what are wasps good for, anyway? Well, contrary to what many people believe, colonial wasps are not simply ruthless stingers just waiting for a chance to hurt unsuspecting humans. Wasps do not gain anything when they sting. They will, however, aggressively defend their nest when it is threatened. Unlike honeybees, wasps have a smooth, barbless stinger and do not die after they sting, therefore, when their nest is threatened, wasps do not hesitate to seek out the threat in large numbers. People can and do get stung when there is no nest in the vicinity, but this is usually due to wasps getting in positions where they may have to defend themselves. Wasps will sting if they get caught in a persons clothing or if they get in situations where they are threatened to get squished. They will also sting if they get stepped on or smacked by a flailing hand. If a wasp flies into your car while driving, there is no reason to panic and almost drive off the road. The wasp is disinterested in you. Likewise, if a wasp is checking you out at a park or in your backyard, it will simply land on you and walk around; it is looking for food and human is not on the menu. When people get stung, away from a nest, they often do not know that they have threatened to squish a wasp and therefore believe that the wasp has stung them for no reason at all. Most wasps in colonies are female. Only female wasps have stingers. Wasps are important predators of other insects. As with all predators, wasps fill a niche in their ecosystem which helps to keep their prey populations at reasonable levels. Wasps eat flies, caterpillars, bees, ants, spiders, earwigs, craneflies, crickets, moths...... They also eat plant nectar, as well as honeydew, which is a sticky, sweet substance secreted by aphids and some scale insects as they feed upon plant sap. Though the female adult wasps are the hunters, they lack the enzymes that are necessary to absorb nutrients from the prey that they gather. Because of this, wasps utilize “trophollaxic feeding.” The hunters fly their catch back to their nests, pass it to other workers who are in charge of feeding the larvae (right). The larvae are fed, and in return the larvae provide partially digested food for the adults. Yes. Some birds are predators of wasps. Native hornets, D. maculata (actually not a true hornet, they are another wasp species), compete with and eat smaller wasps. Raccoons can decimate wasp nests to eat the many levels of brood. Do the fake wasp nests that you can buy at the store really work? Well, in our opinion, the fake wasp nests that you buy and then hang in hopes of deterring wasps from building nests on your property do not work for the reasons that they are advertised for. Yes, wasps are territorial across species, however this factor does not deter members of the same species from building nests in close proximity to one another. No moment demonstrated this fact better then when Joe Wasp was called to remove three separate D. maculata (bald faced hornet) nests from one Rhododendron bush in a customers front yard. After years of observation and trying to openly consider this question we have concluded that if there are no wasps in a fake nest, the wasps will not be territorial. Wasps interpret the world mainly through their antennae, and communicate via pheromones. If these fake nests indeed have an influence, it is only because they are taking up valuable space. If the fake nests are taking up desirable wasp real estate then the wasps cannot make a nest there. However, considering that a single house likely has tens or even hundreds of suitable micro-locations for wasps to set up their nests, the fake wasp nest’s actual value is minimal. 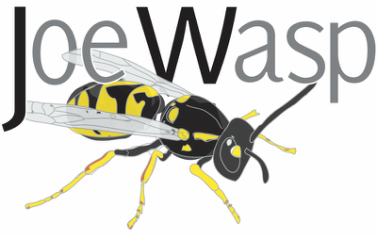 WASPS are yellow and black or white and black in colouration. Unlike honeybees and bumblebees, they are not fuzzy, but smooth skinned. Wasps are more aggressive than bees. They do not die when they sting and can sting multiple times. Wasps are not pollinators. They are predators. They do not flit from flower to flower collecting nectar and pollen, but instead hunt other insects. Wasps live in grey paper nests that often hang under the eaves of a house, although they can be found in countless other locations as well. HONEYBEES are small, fuzzy, golden/dark brown striped insects. Honeybees are vegetarians: they only eat nectar and pollen and will flit from flower to flower collecting these foods. Honeybees are reluctant to sting because they can only sting once before dying. The act of stinging kills a honeybee, so it will only sting in a dire situation. Most honeybees in the Lower Mainland are kept by beekeepers for pollination purposes or to produce honey, but very occasionally people may find nests in their homes. The nests are made of beeswax honeycomb and are not usually visible from the outside of the house. BUMBLEBEES are extremely fuzzy yellow or orange and black insects that vary in size from quite small to very large. Bumblebees have a round, chubby, body shape. Bumblebees are vegetarians: they only eat nectar and pollen and will flit from flower to flower collecting these foods. Unlike honeybees, bumblebees are more aggressive, but only when defending their nests. They do not die when they sting and can sting multiple times. Many people are stung by bumblebees when walking barefoot in the summer; they tend to hover on clover that grows in the grass. Bumblebee nests are fairly small, well disguised, and hard to spot. You probably haven't seen one before. Check out out our insect identification page for more details. Sorry, although we care very much about the environmental importance of all the insects we deal with, we do not do removals for free. We are no longer offering bee swarm relocation services.